Your printed and online materials are often the first impression a client will have of your business. Are you portraying the image you need to give you credibility and grow your business? Effective graphic design is a combination of good design principles, technical skill and that intangible quality called creativity. When all come together, a marketing piece “connects” with the reader… and motivates action. Our top-notch, in-house graphics professionals possess both creative and technical skills, learned through years of on-the-job experience. Our knowledge and experience are reflected in every design, whether it be a business card or a full-size vehicle wrap. We offer everything from creative consultation and conception to art direction, layout and production. By choosing the right fonts, graphics, colours and custom design elements, we’ll create a unique style that prints correctly and makes a great impression, while perfectly reflecting your company’s personality and brand identity. First impressions shouldn’t be left in the hands of an amateur. 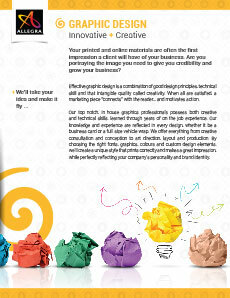 Trust a professional graphic designer to deliver creative, lasting results. Call now to get started.